He spent about four months training for the challenge. 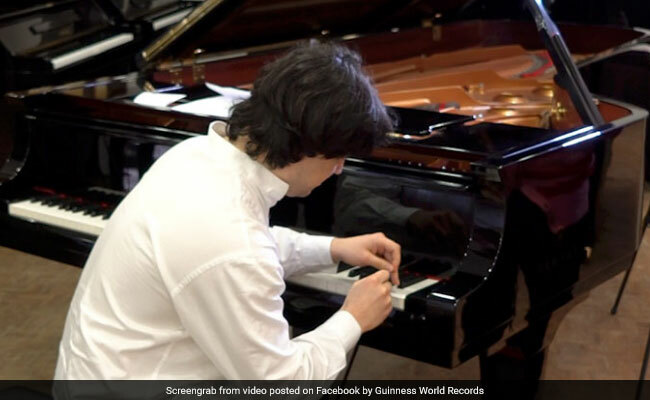 A man recently set a Guinness World Record by playing the piano and, surprisingly, it wasn't by playing a particularly complex musical composition. Rather, Portuguese-American musician Domingos-Antonio Gomes played a single note over and over again - as many times as he could - in a single minute. He smashed the record for the most piano key hits in one minute by hitting the B7 key a staggering 824 times. Mr Gomes says he spent about four months training for the challenge. His technique was to alternate between two fingers. And, clearly, it paid off: he beat the previous record by an impressive 59 hits. The record has some on YouTube laughing however. "Me ringing someone's door bell," jokes one person. "Me typing my project an hour before class," laughs another. "Finally a song I can play," comments a YouTuber. But, as it turns out, Mr Gomes is quite a talented pianist. He's a professional who has been playing since the age of seven. "I broke this record in order to gain visibility in the international world of music by demonstrating my athletic prowess on the piano" he explains. Mr Gomes played on an unmodified Yamaha CFX concert grand piano in a music store in Lisbon, Portugal on March 4.